The title of this post is the same as that of this article on the Railway Gazette. Researchers at Xi’an Jiaotong-Liverpool University’s Suzhou campus have developed an algorithm intended to optimise the storage and reuse of braking energy. Regenerative braking energy is stored on the trainand reused, rather than returned to the grid. Ten percent savings are claimed. I’ve always thought this was possible. This is the first three paragraphs.. Concrete is the most widely used man-made material in existence. It is second only to water as the most-consumed resource on the planet. But, while cement – the key ingredient in concrete – has shaped much of our built environment, it also has a massive carbon footprint. Cement is the source of about 8% of the world’s carbon dioxide (CO2) emissions, according to think tank Chatham House. The title of this post, is the same as that of this article on the BBC. I have been against coal as a fuel for at least fifty years. Initially, it was for three reasons. Growing up in the 1950s and 1960s, there regularly seemed to be a serious coal-mining disasters like Aberfan and Katowice. My health had been seriously affected by London’s domestic coal fires. I also believed that nuclear power could supply us with affordable energy. Also at Liverpool University, I met so many students, who were from mining areas, with horror stories of the health of miners. Over the last couple of decades, I’ve gone very much against the building of large nuclear power stations, although I do feel that small modular nuclear reactors may have a place. But the growth of wind and solar power has convinced me that with the addition of energy storage, we can manage without coal. Obviously, the Chinese and Donald Trump think differently. It should be noted that we are an island and if sea levels rise we will suffer, whereas China and the United States are large land masses with plenty of places to develop. Trump and Xi Jinping need to be reeducated. It certainly looks to be an impressive bridge. But I think it shows just how far design and construction of large bridges has moved in the last couple of decades. In A Solution To The Northern Irish Problem!, I proposed building a fixed link between Northern Ireland and Scotland. The Chinese bridge has a length of 55 km, whereas a link between Northern Ireland and Scotland would be about 30 km. I wouldn’t be surprised that the opening of the Chinese bridge will push politicians, engineers and financial institutions to look seriously, at a fixed link across the North Channel. Rolling stock manufacturer CRRC has announced that the world’s first hydrogen-powered tram has been put into passenger operation in China. The three-carriage hybrid electric tram enter service in the city of Tangshan, Hebei, on October 26. It seems to have the following characteristics. It all sounds very tram-like. It does seem there’s a lot of train and tram manufacturers thinking about hydrogen power. The title of this post is the same as that of this article on Global Rail News. This is the first two paragraphs. A new rail corridor linking Azerbaijan and Turkey via Georgia is set to launch in September, establishing a new freight and passenger link between Europe and China. Every year, millions of tonnes of cargo is expected to be transported on the 825km line. Baku, which is the Eastern terminus of the Baku–Tbilisi–Kars Railway, is the capital of Azerbaijan and is a port on the Caspian Sea. It is connected to Turkmenbashi on the other side of the sea, which is the Western terminus of the Trans-Caspian Railway, which leads to Kazakhstan, Afghanistan and China. At the other end of the line Kars in Turkey is connected to the European rail network. Freight forecasts for the route in the Global Rail News article are bullish. According to estimates, by the third year the annual turnover of cargo on BTK will be three to five million tonnes, rising to six to eight million by its fifth year and more than 10 million tonnes in its 10th. By 2034 this figure is anticipated to reach 17 million tonnes of annual freight. The sea journey takes between four and six weeks. This article on the BBC is entitled All aboard the China-to-London freight train. This is an except from the article describing why Tesco use trains to get goods from China to the UK. The UK’s biggest supermarket, Tesco, doesn’t have any goods on this particular train but does use rail to carry toys, electrical goods, homeware and clothing from China to European rail hubs such as Bratislava in Slovakia and Krasnaje in Belarus. Alistair Lindsay, Tesco’s head of global logistics, says the supermarket prefers shipping its goods because this is the most environmentally friendly way, as well as offering the best value for money, but that “where we need to move products quicker we have that option to do it by rail”. This decision would normally be driven by customer demand for particular products, he says. So it’s all about value-for-money and customer demand. I am drawn to the conclusion, that the Baku–Tbilisi–Kars Railway will meet the forecasts. It has the great advantage over some of the other routes, that it avoids Putin’s Russia, which must be a good thing. This article in the Railway Gazette is entitled First China to UK rail freight service arrives in London. The article describes in detail how 34 containers came all the way to Barking by train. The trip can be summarised as follows. The trip took seventeen days, which was faster than container ship. The trip is slower, but a lot cheaper than air-freight. The trip is 12,000 kilometres. There were two changes to gauge and transshipment of the containers on the route. It is intended to run the trains for three or four months to assess demand. The article finishes like this. The project supports the Chinese government’s One Belt, One Road trade connectivity initiative to create a modern-day Silk Road. According to DB around 40 000 containers were transported by rail along the routes between China and Europe in 2016, with journey times of between 12 and 16 days. Annual traffic is expected to increase to 100 000 containers by 2020. If these figures are achieved, it certainly looks like the route could be approaching viability. 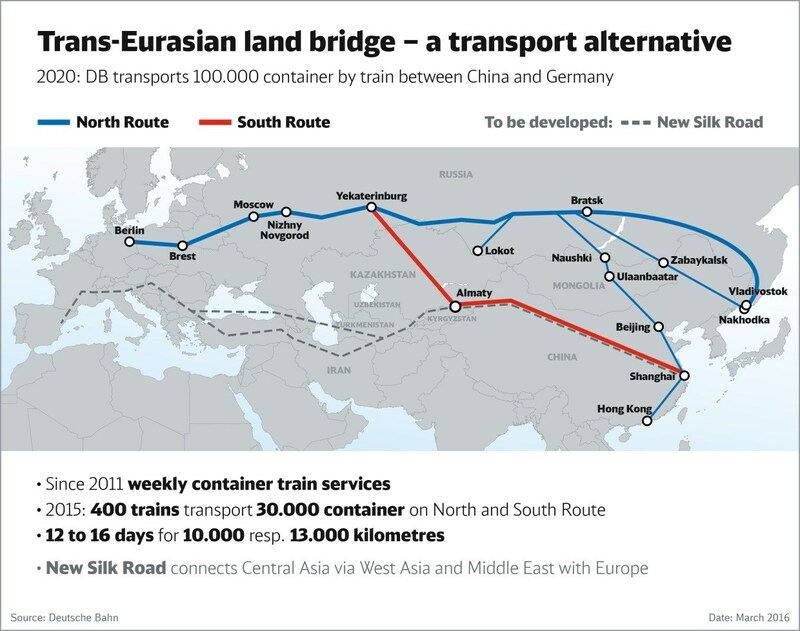 In How To Move 100,000 Containers A Year Between Germany And China, I wrote about German plans to create a standard gauge railway from Germany to China via Georgia, that would avoid Russia and all the gauge-changing. Without the gauge-change, this would surely be a faster route, thus increasingly viability. There’s going to be an interestimg commercial battle in the next bfew years between the various metods of getting freight between Europe and China. This article on Global Rail News is entitled DB and Georgian Railways to cooperate on new Silk Road rail corridor. It described how Deutsche Bahn and Georgian Railways have signed an agreement to develop a new rail freight route between the Far East and Europe. This map from the article, shows the various rail routes across Eurasia and how the new Silk Road will fit in. I think the most interesting thing about the new route, is that it doesn’t go through Russia. Vladimir Putin will not be amused! If you read the Wikipedia entry for Georgian Railways, it does list a few problems, but it would appear that the route across Georgia is being upgraded to Standard Gauge all the way from the Turkish border to Almaty in Kazakhstan. With Germany, Turkey and Europe at the Western end and China at the Eastern end both predominately Standard Gauge, I think that this route will be all the same gauge. When this happens, trains will be able to go straight through, with perhaps just a change of locomotive. How long will it be before, an enthusiastic entrepreneur starts to run a passenger service between Europe and China. Trans-Siberian Express eat your heart out! Vladimir Putin will be even less amused! If DB can build the Standard Gauge railway through to China via Georgia, it will give the following benefits. Services will be faster than the Russian routes. There will no change of gauge, which means unloading one train and loading another. If the line is electrified, this will make the route more efficient. Freight will move smoothly across Asia avoiding the pariah that is Russia. The route avoids the more volatile parts of the Middle East. Countries on the route like Serbia, Turkey, Georgia and Kazahkstan will surely benefit. The route will surely be more accessible to Southern European countries, than the current Russian routes. It is undoubtedly a good plan.